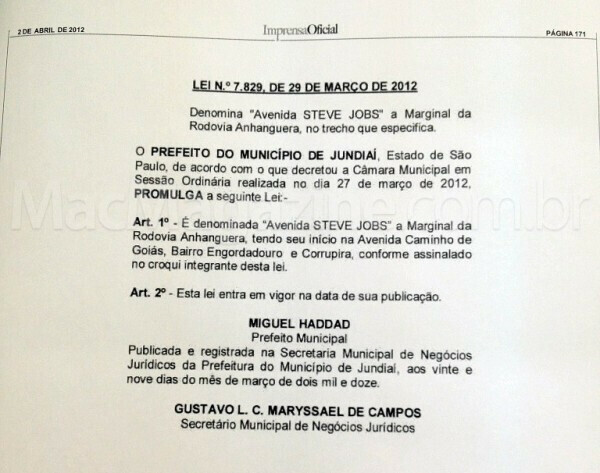 According to Brazil's MacMagazine, Mayor Miguel Haddad in the city of Jundiai has approved changing the name of one of the streets in the city to pay tribute to the late Steve Jobs. The co-founder of Apple died last October 5th after battling pancreatic cancer, and the idea to name the street as a tribute was first brought up the very next day. 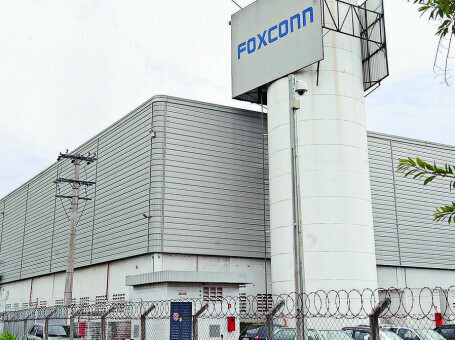 Last year, the Mayor said that he picked that specific location for "Avenida Steve Jobs" because the road winds around the Anhanguera highway, along which Foxconn built its factory that manufacturers the Apple iPhone 4 and Apple iPad 2. Apple Insider says that since last February, units of the iPhone 4 constructed in that facility have been available, and that iPad 2 units built in the same factory will soon be offered for sale. 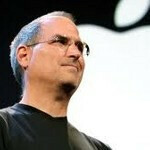 Apple CEO Tim Cook has said that he expects "major growth" from Brazil. Domestic production is the key to turning a profit in the country since Brazil's import tariffs are high enough to double the price of some imported Apple products for sale in the country. Is it possible to patent cities? What's it called? 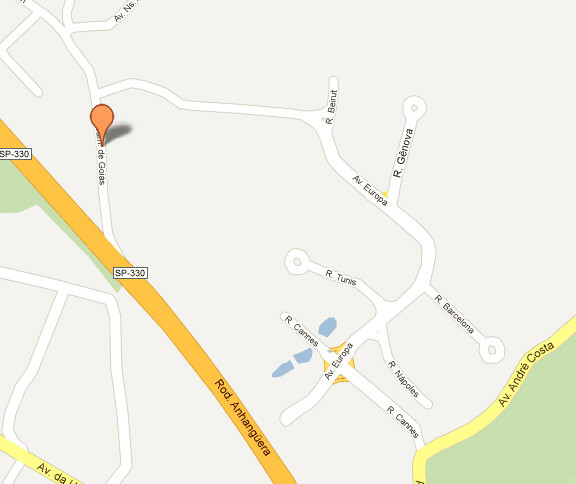 iDeviL's wAy???? You are just jealous because you have never accomplished anything in your life like steve jobs did. You are so right, it is so difficult these days , in a world so vast, to steal others' ideas and patent them as your own to make billions; or, to have everyone whom you've ever dealt with and has come physically within an inch of your nAusiAting presence to only speak ill of you; or, to be such an insecure control freak (probably due to the fact that you were abandoned by both parents) that you must exercise absolute control and authority with regard to how other people who have overpaid for a liMiTed-in-functiOnAliTy product actually get to use it; yes, I've never accomplished being the sole sAviOr and leader of millions of mindless lost and in dire need of vAliDation four-legged mammals (two when on bended knees). Just because he made billions, doesn't mean he was a decent human being. the Nazi death camps were also quite profitable. Completely agree... Now note the facing-in barbed wire all over the place!!! I call them no such thing, I just say: baaaaa-haaaa-haaaa-aaaaa.... "°•°"
As a Brazilian, i am deeply disturbed and ashamed of such. I hope every worker there sabotages those pieces of iJunk. Nough said. Wonderful news. The Free Market marches on,opening new avenues for cheap unskilled labor throughout the Third World,therefore enabling us to enjoy more affordable higher end electronics. Brazil is on the right track,now let the rest of Latin America follow suit. sorry your on phonearena.com. if you like apple, you're an idiot I guess. Theres no such thing as just simply preferring apple products here. your just a sheep. I thought high tariffs killed jobs ? So I guess that if the US raised tariffs on certain imports, Apple would have to bring some of those jobs back to America. Tariffs well as unions and the Federal Minimum Wage should be completely eliminated. Free Market Capitalism is the only way. US workers are too expensive as it is,they must be made competitive,otherwise jobs will keep leaving overseas. I get that Foxxcon doesn't have a good track record but adding jobs to a small town and reducing the cost of electronic products by bypassing the import tax, albeit being Apple products, is a good thing. P.S. I'm from Brazil so I know how much jobs are needed out there and how absurdly expensive electronics cost.